We waved goodbye to our hilarious and kind hosts, Giulia and Diego (and their very randy dog, Jack!) and took some photos in Trieste before leaving the city and trying to escape the Bora (i.e. the very high winds). Within minutes of driving belongings started flying out of the tuk tuk – a hat, several flags, an industrial sized kitchen roll, a garland and Rach’s reading glasses. Let us pause at this point, Rachel cannot map read, take photos, post blogs, decipher a menu, see the gears of the tuk tuk and much, much more without her reading glasses, so she has been rendered entirely useless for all major Tuk Tuk To Turkey tasks until further notice. Our route from Trieste to Krk took us back into our beloved Slovenia and then on to the Croatian border. 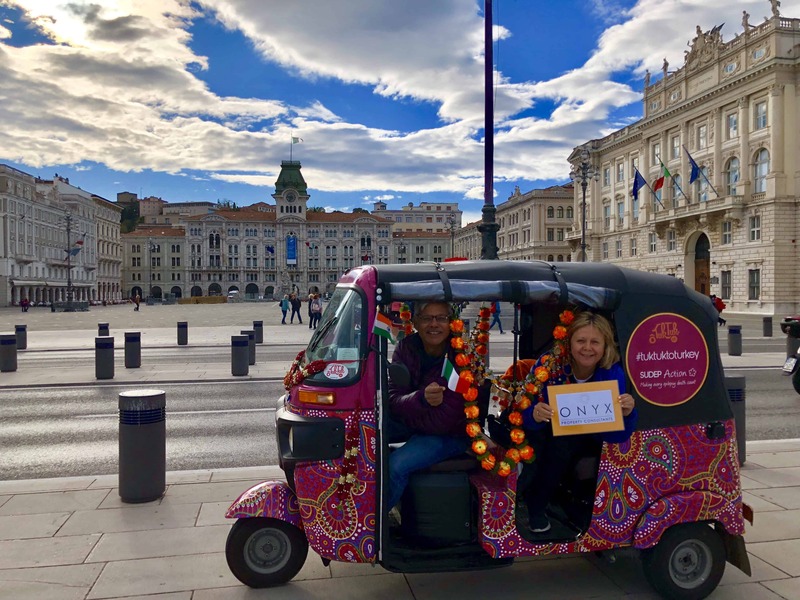 For the first time this trip, we had to show our passports and even our bright pink tuk tuk could not elicit a glimmer of a smile from the stoney-faced, gun toting Croatian officials. The Croatian countryside was quite different to Slovenia, but no less beautiful, with low rolling hills covered with vegetation in autumnal reds, oranges, yellows and green. As we drove further into Croatia the trees and shrubbery became more sparse and the exposed rock more prevalent – as you can tell the drive was pretty uneventful. UNTIL James (recap, he doesn’t do well with hills), was driving the tuk tuk down a precipitous road, which sloped steeply away to the right at the bottom. The tuk tuk can feel like it leans round corners at the best of times, but with James taking the turn at ‘breakneck’ speed, and Bharat sitting on the right in the back, the tuk tuk started to not just lean, but tip. Amy and Rachel watched in horror as the left-hand wheel lifted off the ground and the tuk tuk teetered on two wheels before deciding to land back down allowing James a quick getaway from the judging audience (not that Amy has a wheel to stand on!)! During the drive leading up to the 1.3km bridge over to the island of Krk, the wind had picked up even more and we were worried that the tuk tuk would get blown off (which has happened before to lorries!). To avert further disaster, Bharat appointed himself to take over the handlebars for the “dangerous crossing” and it was communally decided to add Rachel to the back of the tuk tuk for ballast. After all our careful planning, which even involved Amy being told where to find the important documents should Rachel and Bharat be blown off the bridge into the abyss, the crossing was a complete non-event with not even a noticeable puff of wind! We arrived on Krk to stay with our hosts Jelena and Rajeev who plied us with the local grappa the whole evening and took us out to try the local speciality of Dalmation Peka – veal, onions and potatoes which are slow cooked in a huge charcoal oven under a lid piled high with glowing embers. The result was delicious and once again we were ‘forced’ to stuff our faces. After a wonderful evening, the night suddenly deteriorated when James started to vomit violently and continued to do for the rest of the night. There is not a sound that Amy did not hear. Bharat managed a fair few carafes to himself that night and deserved to be the one feeling rotten in the morning, but whilst Bharat woke up just fine, James’ usual smiley face and rosy cheeks were pale and he didn’t utter a word. After a dash to the pharmacy to get rehydration salts, Imodium and bottled water we set off for Zadar with James tucked up in the Fiat. It only took 10 minutes of driving before we had to pull over again for James – not his finest moment in front of the “in-laws”! It was then an early night for the team – everyone is coldy and ill.
Next morning Bharat was getting anxious that we might be 3.245 seconds late checking out and so made everyone wolf down some disgusting Croatian pastries in order to get on the road to Trogir pronto. Half way there and Amy and Rachel, ahead in the support car, had lost Bharat and James in the tuktuk. Turning back to see whether they were OK the two were spotted out of the tuk tuk pushing it to the safer part of the A road we were on. Bharat, as chief mechanic, started to freak out as he lay on his back looking at the undercarriage of the tuk tuk. There was a lot of “oh my god it’s sheared off” and “we’re not going to make it to Trogir” and “this is it, the trip’s over”. A visit to a Croatian car mechanic proved fruitless – they had no idea what to do with the vehicle or the mildly hysterical Indian man that came with it. But the TukTuk UK team thousands of miles away came up trumps: Whatever Bharat had thought he’d seen was fine, we just needed to drain the fuel pipe and within minutes off we went to Krka Waterfalls for a swim. The evening was spent in Trogir which we had driven down to during a beautiful sunset. Our videos and photos could not do it justice. Poor Rachel was bedridden for the evening with a temperature, which unfortunately meant Bharat was forced to drink a carafe of wine to himself. Day 25: In contrast to the surly, mute border guards at the Croatian border, there was a very excitable German motorcyclist who pulled up behind the tuk tuk and could not believe that he had bumped into us, as he had seen us in Slovenia days before. He was so incredulous that we had driven little Sumo all the way from London, which really made us pause to think about just how far we have come. Day 27:When Bharat was getting stressed that we would be late to leave the apartment he hurriedly took everyone’s bags and packed them into the Fiat meaning that when Amy got out of the shower she found she was alone in the apartment with no clothes to put on and no phone to contact anyone on. Oh the irony of Bharat having to come up to find where she was after too much waiting! Day 25: James– for the (almost) tuk tuk toppling moment. Day 26: Bharat– who (a) keeps pronouncing the ‘blog’ the ‘bluuuug’, and (b) rolled in at 2am, when Rachel was trying to upload photos to the ‘bluuug’ and accused everyone of stealing his phone charger and was convinced there had been a conspiracy to hide his adaptor. He also tried to stand on one leg to prove he was sober, and, 45 minutes after taking himself to bed, stormed out of the bedroom, past everyone working on the blog and turned all the lights off leaving the remaining members of the team in the dark and promptly walked straight into the door he’d just come out of. Karma can be a b*tch. Day 27: Bharat: For his mechanical “prowess”. Porkers on the road – we failed to spot any!